Sony is taking the lead in bringing the focus on audio performance to the camcorder market with its new Sony DCR DVD205 camcorder. "Nothing preserves memories better than moving images with sound," said Linda Vuolo, director for camcorder products at Sony Electronics. "We are offering new enhancements to both audio and video performance in our 2006 product line." Now when you record your child's lead performance in cinematic surround sound, you can be sure that his or her voice will stand out clearly in the troupe. In total, Sony is introducing five new DVD Handycam camcorders. Across the DVD line, you find Carl Zeiss optics for exceptional video quality, improved menu functions and access controls. Sony DVD205 - DVD recording - The new Sony DCR-DVD205 provides the benefits of recording video directly to -R/-RW/+RW DVD media. The Sony DVD205 features a one Megapixel Advanced HAD CCD and a high quality Carl Zeiss Vario-Tessar lens, a combination which ensures first class capturing of your favourite moments. 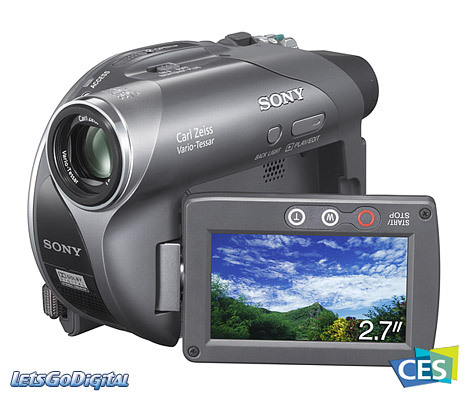 Furthermore the Sony DCR-DVD205 camcorder is equipped with a 2.7-inch wide SwivelScreen touch panel LCD and captures digital still image in 16:9 and 4:3 aspect ratios. The Sony DVD205 will be available in February for about $600. Sony DCR-DVD205 Handycam - Compact design - "People have responded to how easy it is to record and share memories on DVD," said Linda Vuolo, director for camcorders at Sony Electronics. "By offering well-designed and feature-rich Handycam models, we've taken the lead in the sales of DVD camcorders and have helped to create a whole new market." "IDC believes that over the next five years, more than two-billion gigabytes of family stories and funny moments will be recorded, shared and stored on DVD, all thanks to innovative and easy to use products like Sony DVD Handycam camcorders," said Chris Chute, IDC's camcorder analyst. About Sony Corporation of America - Sony Corporation of America, based in New York City, is the U.S. subsidiary of Sony Corporation, headquartered in Tokyo. 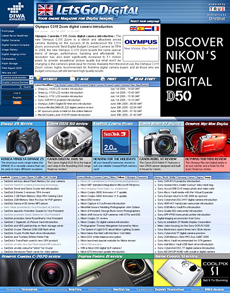 Sony is a leading manufacturer of audio, video, communications, and information technology products for the consumer and professional markets. Its music, motion picture, television, computer entertainment, and online businesses make Sony one of the most comprehensive entertainment companies in the world. Sony's principal U.S. businesses include Sony Electronics Inc., Sony Pictures Entertainment, Sony Computer Entertainment America Inc., and a 50% interest in SONY BMG Music Entertainment, one of the largest recorded music companies in the world. Sony recorded consolidated annual sales of approximately $67 billion for the fiscal year ended March 31, 2005, and it employs 151,400 people worldwide. Sony's consolidated sales in the U.S. for the fiscal year ended March 31, 2005 were $18.4 billion.